Across the entire United States, this winter has been one for the record books. With a polar vortex consuming parts of the country and flooding taking over the rest – nearly every U.S. state has been impacted by snow, sleet, ice and rain this season. Even Southwestern states were not safe from the winter mess. California, Nevada, southern Utah, and Arizona all received snow. But while schools and offices close, flights cancel, and states of emergency get declared, BendBroadband and TDS field service technicians (FSTs) keep working. 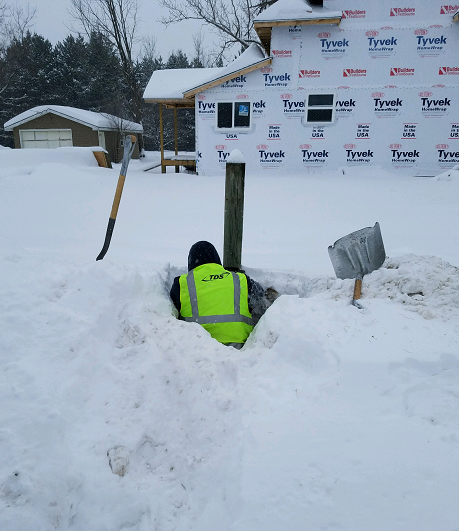 Despite frigid temperatures and multiple feet of snow, our field service technicians are out providing our customers with quality service every day. Even when their own homes are impacted by severe weather, our FST’s prioritize their work for the customers. On Feb. 12, a whopping 18 inches of snow was dumped on Olinda, California, a TDS service area located 150 miles north of Sacramento in northern California. The storm caused widespread outages throughout the area. Six Digital Serving Areas (DSAs) were without power and about 1,000 customers were impacted. The storm meant our field service technicians had difficulty accessing TDS sites to deploy and fuel generators. During the power outage from the storm, FSTs Tom Johnston and Scott Sandifer worked the entire weekend fueling generators. A similar story gets told from FSTs in Jenkins, Minnesota. The scene, a few miles north of Pequot Lakes, made it difficult to complete the task at hand. O ne FST had to make his way through multiple feet of thick snow to access the right equipment. But even after the difficult task of making it to the equipment, the weather can still impact the work. While the work our FSTs have done is incredible, they don’t think much of it. The regional manager summarized the attitude of the FSTs. Several TDS communities have been impacted and continue to feel the effects of the weather with outages in Hurricane, Utah, Bend, Oregon, and more. Over the weekend, Sisters, Oregon. received 21 inches of snow. This week, the BendBroadband retail office in Bend was closed due to the weather. Across the country, in Maine, a communications tower was severely damaged by hurricane strength winds – showing that winter does not plan on stopping soon, but neither will our FSTs. Thank you to all our FSTs coast to coast who continue to provide exceptional service to our customers in extreme conditions! On demand movies will rock you this month!